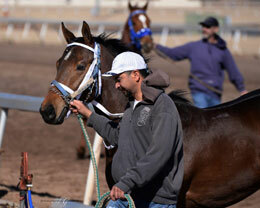 Training races continued on Saturday at Remington Park with more than 165 head participating over the two days. OKLAHOMA CITY, OK�FEBRUARY 15, 2014�For a second day in a row an IVORY JAMES filly scored the second fastest time during schooling races conducted at Remington Park. Horsemen were anxious to get as much work in as possible on Saturday while they enjoyed temperatures in the 60's. The track was forced to delay opening for any type of training due to sub-freezing temperatures over the past couple of week. Ivory Treasure finished a half-side off Miss Diamond Cartel in last of 13 races to get the second fastest clocking of :13.69 seconds on Saturday. Clint Crawford conditions the IVORY JAMES filly out of Jess Effortless, by Mr Jess Perry. Danny Morgan paid $6,000 for the filly as a short yearling from the Bobby D. Cox consignment at the 2013 Heritage Place Winter Mixed Sale. Her dam is a half-sister to Ruidoso Futurity(G1) winner All About Ease ($309,503). On Friday Pt Stylish Ivory clocked the second fastest time of :13.33 seconds, an 84 speed index for the 250 yards. Kasey Willis conditions the IVORY JAMES filly for owner Tom Lepic. She is out of the Shazoom mare Signs Zoomer. For a complete list of horses by times who competed in Friday's trials CLICK HERE. Videos of Friday's races can been found on the OQHRA website. For a complete list of horses by times who competed in Saturday's's schooling races CLICK HERE. Videos of Saturday's races can been found on the OQHRA website.